Try one of our signature brews like our American Lager “The Northern” with one of the best burgers in Naperville. If for any reason you have any questions or comments about our burgers in Naperville, feel free to give us a call at 630-544-3700 or fill out the form on this page and a representative will respond shortly. Our Naperville location specializes in made to order burgers for you, your friends, and your whole family. A great burger can be a hard thing to find which is why Granite City has perfected its handcrafted burgers in Naperville. We serve our signature GC steak burger with natural-cut fries, kettle chips, or GC coleslaw. You can customize your burger with a multitude of fresh ingredients that Granite City has available. 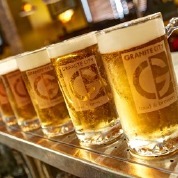 Stop by Granite City Food & Brewery in Naperville today and try one of our signature burgers. Our burgers are the reason people still come to restaurants. Burgers are an American staple and Granite City Food & Brewery does burgers just right. The GC steak burgers in Naperville have truly brought pride back to going out for burgers. From Half-pound to Ten Ounces of burger, you will get your fix with a GC steak burger or try the Bison Burger. If for any reason you have any questions or comments about our Burgers in Naperville, feel free to fill out the form on this page and a representative will respond shortly or give us a call at 630-544-3700.